Special Considerations for wiring in landscape walls and concrete. 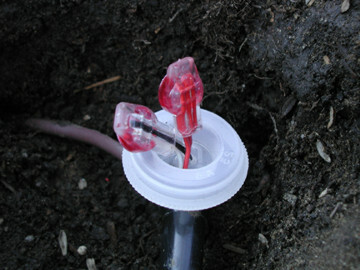 For direct burial in landscape installations, care must be given to keep moisture from corroding the splices. In the first three photos below, a simple displacement type 3 conductor crimp connector is used. This connector is filled with dielectric silicone grease. A cap from a 35mm film roll canister was installed on the wires prior to the connectors. 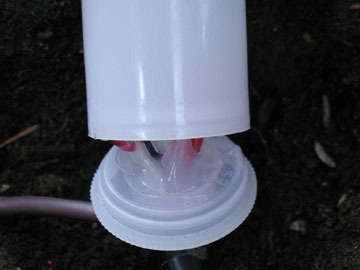 Silicone rubber sealer has been placed around the cap where the wires pass through. The canister is then snapped onto the cap and the assembly is buried in an inverted orientation so that the air trapped in the canister will displace any water which otherwise, if present, might be inclined to flow into the canister. The silicone sealant would have to fail first at any event. When a Tri-Cluster fixture is mounted in any type of permanent structure, consideration must be given to the ultimate need of replacement of the fixture. 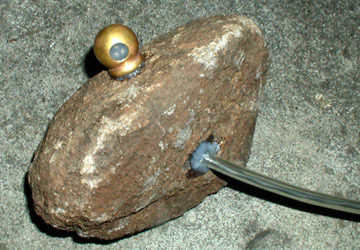 In the case of a mortared rock wall, in the example above, a flexible PVC hose is fed into the rock containing the fixture and will serve as a conduit in the mortar should fixture replacement become necessary. 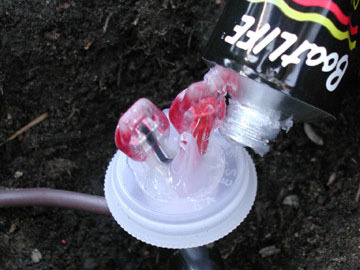 The fixture is adhered with silicone into the rock instead of using a stronger adhesive. This also allows access and ease of replacement if necessary.